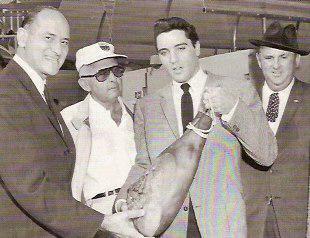 On Wednesday, September 12, Elvis and the MGM crew started their second week of shooting on the World’s Fair grounds. During a mid-day break, Elvis and Colonel Parker met with Washington State Governor Albert D. Rosellini at the downtown Monorail station. Rosellini had been credited with first pitching to Hollywood executives the idea of using the Seattle fair as the scene of a major motion picture. Asked what happened to the ham, the governor said he had sent it back to the state capital of Olympia. Later the ham was found in the possession of State Patrol Capt. D. D. Daniels, who wasn’t sure what he was supposed to do with it. “It would look awfully good in my refrigerator,” he said. The conversation suddenly ended as rain began to fall. Parker scooped up his photographs and headed for shelter. Elvis hadn’t arrived on the set by then, and neither had Joan O’Brien, who was rumored to have a migraine headache. With planned shooting delayed, director Taurog had the World’s Fair band walk through the picture’s closing scene several times. The band marched west from the NASA exhibit, winding through poles that supported hanging baskets of flowers. Elvis finished up his portion of location filming at the Fair on Friday, September 14. Another large crowd was on hand to get a final glimpse of Elvis in Seattle before he left town. The concentration of spectators finally sent one of them to the hospital. About 3:30 in the afternoon, Mrs. Ellen Yorg, 76, of Van Nuys, California, was taken to Seattle’s Providence Hospital after suffering a possible foot fracture when a three-wheel motor scooter backed over her foot. 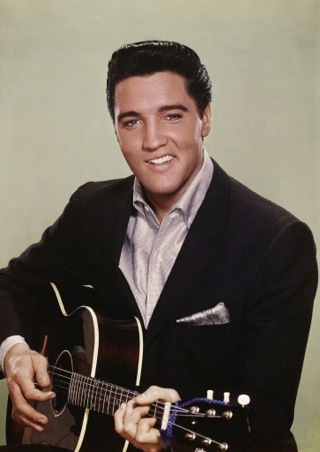 Elvis finished his day’s work before the cameras, and early the next morning, after spending 10 days in Seattle, he and his entourage were back on the road driving south toward Los Angeles. Filming resumed a week later at MGM’s Hollywood studios on September 17. In fact, a number of scenes in It Happened At the World’s Fair that appeared to show Elvis in Seattle were actually shot in mockups on the MGM lot. For anyone who attended the World’s Fair in 1962, some of those scenes are easy to spot. For instance, the Monorail zipped back and forth between downtown Seattle and the fairgrounds in just 60 seconds each way. In one scene in It Happened At The World’s Fair, however, the Monorail run is stretched out to over two and a half minutes to allow time for Elvis’s song “They Remind Me Too Much of You” to play through. The view of the receding fair at night from the rear window of the Monorail had obviously been filmed in Seattle and then inserted at less than half-speed behind Elvis and Vicky Tiu as they sat in a studio Monorail car mockup in Hollywood. Another odd scene occurs when Elvis and Joan O’Brien share a table in the Space Needle’s rotating restaurant. The scene obviously was not shot in the actual “Eye of the Needle” but rather in Hollywood. Producer Ted Richmond must have thought that the audience’s eyes would be so focused on Elvis singing “I’m Falling In Love Tonight” to O’Brien that they wouldn’t notice the background. There the restaurant’s windows can clearly be seen rotating, while the outside scenery remains unchanged. In the actual Space Needle restaurant, however, the effect would have been exactly the opposite. Since the entire restaurant rotated, the outside view, and not the windows, would have moved around the diners. Elvis finished up his work on It Happened At the World’s Fair on November 9, 1962, and headed to Las Vegas for some vacation time. The film premiered in Los Angeles on April 3, 1963, and opened nationwide a week later. Since the Seattle fair had closed six months earlier in October 1962, the movie lost much of the punch its setting might have had at the box office. Unfortunately, MGM’s schedule dictated production in September 1962, shortly before the fair closed. 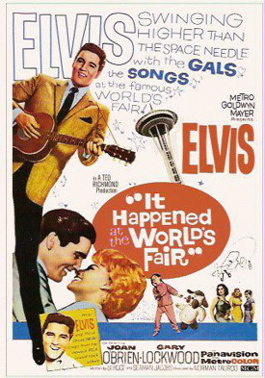 If filming could have been done during the previous April, when the fair opened, the picture possibly could have been released before the fair closed, thus capitalizing on the excitement generated by the Seattle World’s Fair throughout its run. 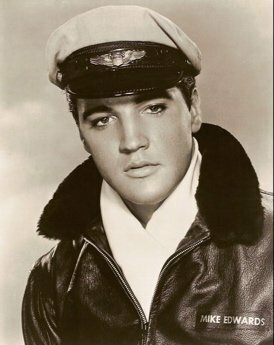 For a Presley feature at the time, the film did only average business at the box office, even in Seattle. It came in at #55 on Variety’s list of “Big Rental Pictures of 1963” with a gross of $2.25 million. "Elvis finished his day’s work before the cameras, and early the next morning, after spending 10 days in Seattle, he and his entourage were back on the road driving south toward Los Angeles."